Robin Williams' death leaves us stunned. Ferguson, Missouri, erupts in violence again. And an experimental Ebola drug is on its way to Liberia. A doctor, a genie and everything in between: The world lost a comic icon yesterday, his death sudden and unexpected. 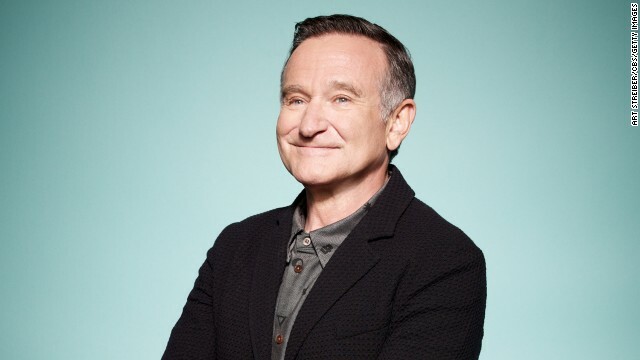 Robin Williams, who left a lasting impression on both young and old in numerous memorable turns, apparently took his own life, law enforcement officials said. In public and in his movie roles, he was irreverent, he was quirky, he had a motor mouth. In private, he battled demons. He made at least two trips to drug rehab, including a visit this summer. He was 63. "Robin Williams was an airman, a doctor, a genie, a nanny, a president, a professor, a bangarang Peter Pan, and everything in between. But he was one of a kind. He arrived in our lives as an alien - but he ended up touching every element of the human spirit. " Violence flares again: Yesterday was supposed to be Michael Brown's first day at technical college. But the 18-year-old was shot dead by a cop over the weekend. And since then, the St. Louis suburb of Ferguson has been a racially charged tinderbox. Residents say the African-American teen was unarmed and surrendering when the officer opened fire. Cops say he attacked the officer and tried to take his gun. A Sunday vigil devolved into violence and looting. And then last night, cops fired tear gas to disperse a crowd. The feds have opened an inquiry, with Attorney General Eric Holder saying the shooting "deserves a fulsome review." Fatal confrontation: One makes millions on the NASCAR circuit, but loves racing against amateurs on dirt tracks. The other had been winning races since he got behind the wheel of a go-kart at 4. The confrontation between the two turned deadly Saturday when three-time NASCAR champ Tony Stewart's car struck and killed Kevin Ward Jr. Ward had gotten out of his car to vent his anger after a tangle with Stewart caused him to spin out. His autopsy said he died of "massive blunt trauma." Cops say they're investigating, but so far there's no evidence that a crime was committed. Desperate times, desperate measures: The death toll from the Ebola outbreak has soared past 1,000, making it the deadliest Ebola outbreak in history. This has prompted the World Health Organization to say that it is ethical to offer medications to fight the virus even if a drug's effectiveness or its adverse effects are unknown. The desperation has pushed Liberia's government to ask for scarce quantities of an untested drug from a U.S.-based company. The plight of the Yazidis: The face of the 15-year-old says it all. Tears stream down, she looks exhausted, she glances around the inside of a helicopter with confusion in her eyes. The Iraqi air force and fighters with the Kurdish peshmerga carried out a dramatic rescue mission yesterday at Mount Sinjar, taking supplies to desperate Yazidis and ferrying a handful of people out. They were the fortunate ones. Thousands of others are in desperate need of help, trapped without food, water or medical care in the stifling summer heat. - Grandpa gets a puppy: After 63 years of marriage, this grandpa lost his wife and his dog within months. So, to cheer him up, his family got him a new puppy. Needless to say, there are tears all around. - Forget the TV, hand me the remote: Watch this baby go bonkers every time a TV remote is within sight. - The truth about cats and dogs: This dog just wants to be loved. This cat's not having it. - Canine cuddle time: A toddler cuddles with a bull terrier on the couch. Cuteness ensues. - Bada** busking: Hey Blue Man Group, you've been put on notice. Very good and concise, thank you. When the 5 things to know today show nothing but death, death, death, death and death, it is very hard to feel happy and alive and we wonder why people leave us sooner than we want or expect them to leave I must say it is harder to have a" great NEW day" after having just scrolled through the top 5 today, but such is life. My condolences to the family of Robin Williams, someone who was first to really school me as a kid growing up, through his great performances, on what real comedy truly is. He will truly be missed. RIP Robin Williams.You will always be loved and never forgotten. Grandfather's new puppy chosen by his granddaughter is precious. So many tears this New Day morning.